80% of data has a geospatial dimension. MAP YOUR DATA. ANY DATA. Discover how analyzing your data with our mapping intelligence solutions reveals hidden opportunities. Let mapping intelligence enhance your business ! Create well-balanced sales rep portfolios to enhance the performance of your sales team. Measure and optimize marketing campaign efficiency by targeting territorial specificities. Locate all your Human Resources KPI directly on a map and analyze them visually per country, per site or per service. We’re using C&D Online to monitor the profitability of our agencies. It allows us to immediately visualize their performance and to put place the most adapted action plans to challenge our local network. Visually representing our KPIs on a map is also a very powrful tool for our communication. With C&D Online, make the most out of your data through statistical and advanced geographical analytics, empowered by our map-based data visualization solution. 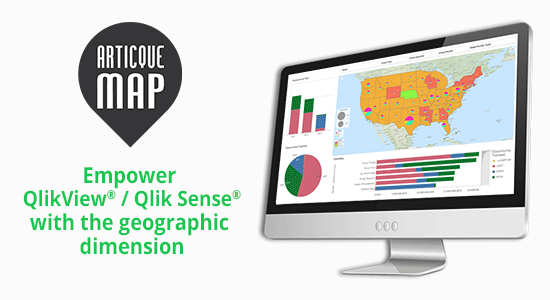 Our internationally recognized BI extension Articque MAP for QlikView / Qlik Sense adds the geographic dimension to your BI software in an cost-effective way.